Top seed Gregory Gaultier triumphed in the Grasshopper Cup final, beating Simon Rosner in straight game in an all-European encounter. In control for the first two game, the Frenchman had to fight back from 6-9 in the third with five points in a row to maintain his impressive record against Rosner. Top seed Gregory Gaultier will meet Simon Rosner in an all-European Grasshopper Cup final in Zurich after contrasting victories in today's semi-finals. Frenchman Gaultier was always in control against Colombian Miguel Rodriguez, winning in straight games, while Germany's Rosner came through a tough four-game encounter to beat Omar Mosaad in four games that took over an hour and a half. While the first three quarter-finals in Zurich went according to the seedings with top seed Gregory Gaultier and third seed Miguel Rodriguez setting up a mouthwatering semi, fifth seed Simon Rosner, who ended the run of qualifier Saurav Ghosal in four tough games, will face unexpected opposition after Omar Mosaad put out fellow Egyptian Ramy Ashour, the second-seeded world champion succumbing to injury towards the end of their fourth game. Ramy Ashour denied the home fans in Zurich a victory to savour as the world champion came from two games down to beat Swiss champion Nicolas Mueller. He'll meet fellow Egyptian Omar Mosaad for a place in the semis after the sixth seed eased past qualifier Alan Clyne in straight games. Simon Rosner also disappointed the home crowd as he beat wildcard Reiko Peter, in straight games, and the German fifth seed now meets qualifier Saurav Ghosal in the quarter-finals after the speedy Indian scored a second successive upset win over Tarek Momen, the fourth seed. The top half of the draw saw one upset as England's Daryl Selby scored a second upset win over Borja Golan, the seventh seed, this month. He'll play top seed Gregory Gaultier in the quarters after the Frenchman beat Cameron Pilley in three close games. THird seed Miguel Rodriguez came from a game down to beat LJ Anjema, and he'll face Mathieu Castagnet after the eighth seed did the same against compatriot Greg Marche. First pair through to the main draw are Saurav Ghosal with a 3-0 win over Olli Tuominen, and LJ Anjema, beating Omar Abdel Meguid 3-1. The first day of the Grasshopper Cup saw eight qualifying matches, with wins for all the seeded players as all the locals bowed out. 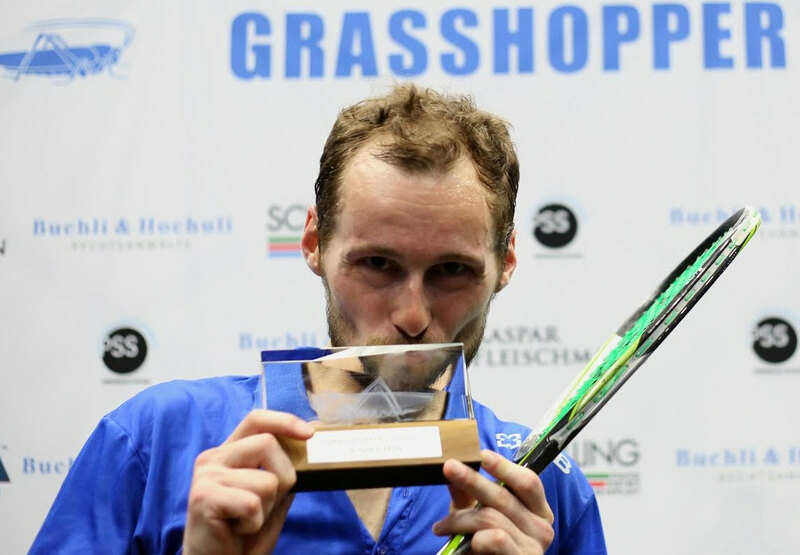 World No.2 Gregory Gaultier will be favourite to claim a 29th career PSA title when the PSA $70k Grasshopper Cup gets underway in Zurich. The maverick Frenchman has failed to add to his title tally since winning the 2014 NetSuite Open but he'll be hungry to return to winning ways when the tournament moves to the new all-glass court at the city's Giessereihalle Puls 5 venue, but with six of the world's top ten, including 2014 World Champion and newly re-crowned El Gouna Ramy Ashour, all in contention, it promises to be an exciting week in Switzerland. Home favourite Nicolas Mueller will take on Ashour in the first round, when he'll be hoping to spring a huge upset, while wildcard Reiko Peter faces a tough task against World No.9 Simon Rösner in one of the toughest 16-man draws seen on tour this year. And with Miguel Rodriguez, Tarek Momen, Borja Golan, Mathieu Castagnet and Omar Mosaad also all in contention, Swiss squash fans will be in for a treat of top class action.